The stereotypical German tends to have a more than unhealthy obsession for Swedish peculiarities. Be it moose, road signs with moose, or moose's feces you bet your arse there is a German willing to pay good money for it. The moose loving tendencies of Deserted Fear remains shrouded in mystery, but their love for Swedish death metal is more than obvious. 'Dead Shores Rising' has that distinct rotten smell of early 90's Entombed that is so popular in, well, any country these days. But the Swedish influences are not confined to the Stockholm scene alone, but there are also distinct influences from the Western of the Swedish death metal scene, namely that from Gothenburg. These are primarily found in the more melodic riffs and guitar lines. All in all, 'Dead Shores Rising' is a fairly well-composed album with memorable songs each bearing a distinct identity. The execution is good, the vocals above average, and the album has a fairly unique touch. There is a problem, however, that prevents this from becoming an instant candidate for top ten albums of 2017. The album lacks energy and attitude. It is, to be frank, almost meek in that department. The main cause behind this is the production. I do not mind melodies in death metal. Admittedly, I have no softer spots for the Gothenburg sound in general, but I still enjoy the distinct melodies of Dismember, Feral, and Miasmal. These, however, relies on a potent production to keep my interest and the production on 'Dead Shores Rising' is way too sterile and neat to bear the material presented. A bit surprising coming from Dan Swanö to be honest compared to, for instance, the last few Asphyx albums. I can definitely see the potential Century Media has found in this act even though it is not strictly my cup of tea. If this is a fruit-flavored barely more than transparent brew, I prefer my nearly black Earl Grey. 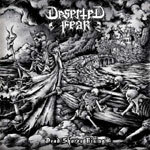 Still, Deserted Fear are good composers and those less picky when it comes to the softer sides of death metal should really give this a shot.